I am celebrating a milestone birthday this year and have just chosen my gift - Above is a little clue - I wonder what it could be? Just in time for easter I have had some lovely things arrive in store. 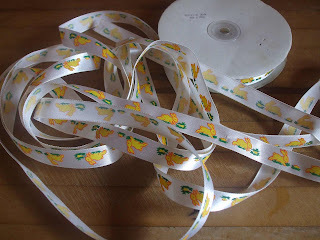 This bunny ribbon trim is adorable at just 98c for 2 metres. And some delicious looking Rounneries in dessert roll form - Yum !! Have you felt this fabric yet? It has such a different luxurious feel. I am currently using it in a few small projects - I will show you next time. Thanks again for all of the lovely well wishes - I now have an appointment with a "specialist" so it is just a waiting game for now. I am off to the Quilted Crow's gathering with Marg Low and Gail Pan next weekend - I am really looking forward to seeing their new designs. How are you going with your Baseco bag? Mine has had her first outing and has become my "handbag" for now. If you have finished yours please leave me a message so I can pop on over and check it out. Well is it the number plate or some to fix it too? How exciting - are you having a party??? I hope you enjoy your special milestone year! Maybe a lovely Yellow Beetle (with a Gerbera in the vase) to attach the number plate to. No have NOT started the bag, Have to do my UGLY first. 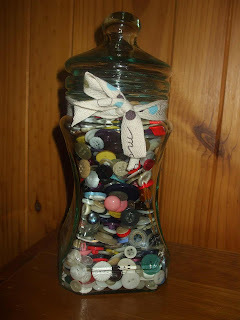 What a nice giveaway,, The jar is super and love it filled with buttons..I have not felt that fabric but know that everyone raves about it and have seen some projects that are really pretty.. Love to have it..
Oh my - are you getting a new car?????? I love your jar, and the new trim and fabrics! Very intriguing. Cant wait to see what it is. Love your vintage jar. Great display of buttons. Im a bit of a fan of Rounneries. Loving the colours. The jar with buttons is so neat! 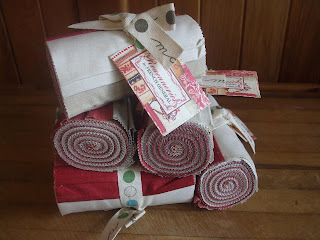 I have never felt that fabric, and could find some wonderful use for it. Hope all will be well with you Fiona.